Are you a morning person? Admittedly, I’m not. Nowadays, invariably I wake up before my alarm goes off, but sometimes leaving that warm cozy bed and getting myself motivated for the day ahead can be a little…rough. How can you beat that feeling, clear your mind and adjust your body for the day ahead? By taking a soak in the hot tub to start out the day! There are too many wonderful things about a morning hot tub soak. First off, just establishing this as part of your routine will help motivate you to get out of bed. What could be more enjoyable than looking forward to your hot tub? 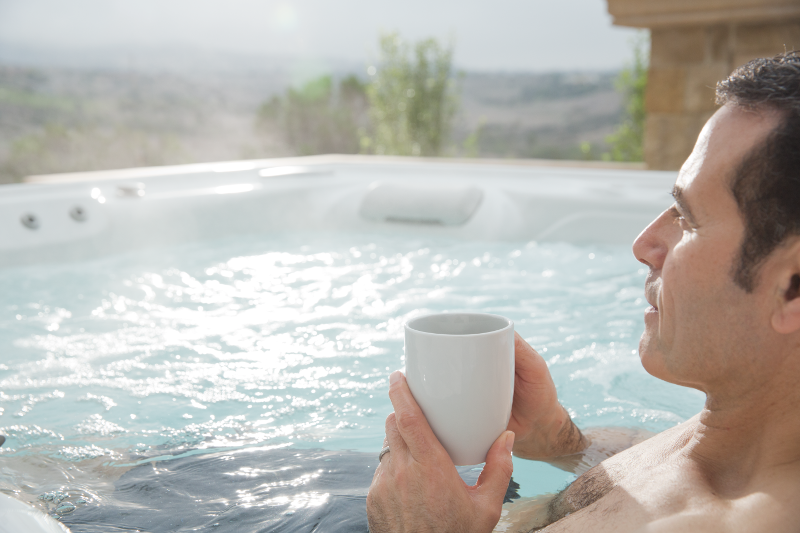 If you’re a coffee or tea drinker, it’s the perfect opportunity to take your beverage out with you to the hot tub to enjoy in the peace and quiet of your own backyard. Just leaving your house, being greeted with crisp morning air, the sound of birds chirping in the morning, taking a sip of a warm drink and immersing yourself in that hot water awakens every part of your being. Spending the first 5-7 minutes just soaking in your tub before turning on the jets is a treat. Feeling that buoyancy release and stretching your limbs in the tub helps rid yourself of any morning stiffness and gets blood flowing to your muscles. Of course, the other benefit of hot tubbing is the resulting endorphin release, which helps improve mood and outlook. The jets can further awaken your body and invigorate your mind. The resulting massage is a wonderful way to treat yourself and prepare you for anything the day ahead places in your path. You will feel like you can conquer it all! Try incorporating a hot tub into your morning routine. You’ll have a whole new appreciation for what hot tub soaking can do for you!